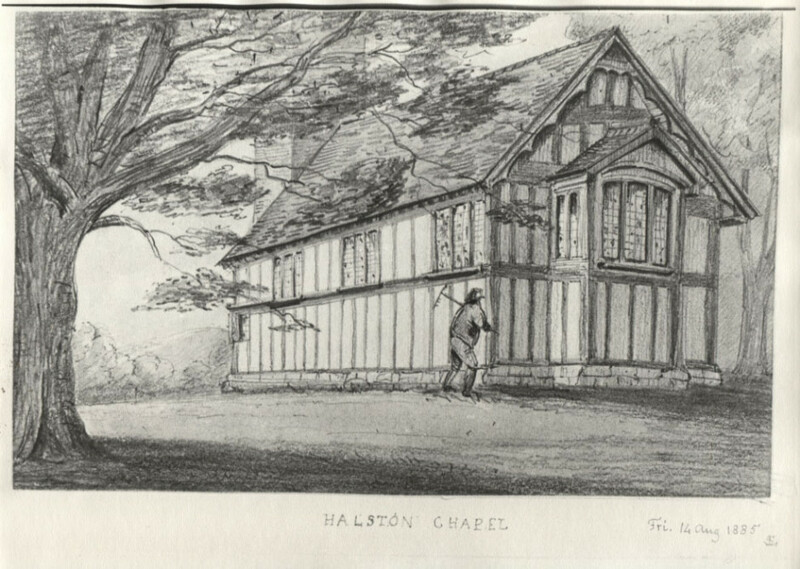 After the monastic confiscatione,Halston, a foundation of the Knights of St. John, and Jerusalem, was sold to Alan Horde, who in the reign of Queen Bess, re-sold it to the ancient Shropshire family of Mytton. They lived here till 1847, when the place was sold to Edmond Wright. The house was built in 1690, in place of one which stood somewhere near the Chapel, in the meadows. The red-brick covering wings, were substituted by Mr. Wright for two office wings, which flanked the main building at right angles. Of the Myttons, one was a famous Parliamentary General, in the 17th. century. Another was an antiquary in the 18th. and the two last were spendthrifts in the 19th. The timbered chapel stands in the meadows about half a mile from the house, surrounded by a sunk fence, and overshadowed by yew trees. It wears a sombre and neglected aspect. It is the burial place of the owners of Ralston, but no regular service is performed here. Halston, or Holystone, was a foundation made by one of the Fitzalans, in favour of the Knights Hospitallers, and was till a late act of Parliament extra-parochial. The Chapel was re-edified in 1725, but there is still left a little woodwork and carving of the 15th. century, and in the Immediate neighbourhood there are foundations of buildings of some extent. There is a fine chalice, paten, and plate. given by a Mytton in 1662. A good candelabrum of brass, with the two headed eagle of the Myttons, and an Italian stove of the 18th.century The estate passed by purchase about 1848 from the Myttons to the Wrights.